You love surfing or always wanted to learn how to surf? Then our partner surf camp in Ericeira, Portugal is perfect for you, offering both surf lesson packages for surf beginners as well as surf guiding packages for advanced surfers. Situated only a few steps away from the beach and world-famous surf spots, our Portugal surf camp offers the right wave for every level of surf ability. 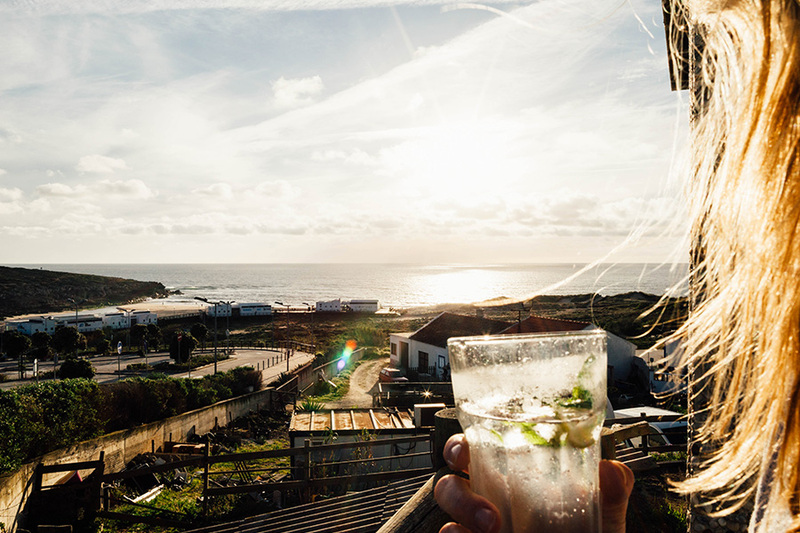 Our partner surf camp here in Ericeira, Portugal is a spacious two-story, white-washed Portuguese style villa with a panoramic roof terrace, perfect to relax on with a few drinks in the evening sun after a long day chasing waves! Located on the west-coast of Portugal, Ericeira is a beautiful fishing town and scenic seaside resort just 35 km north-west of Lisbon and Lisbon Portela Airport. Join us in Portugal this summer to find your perfect surf spot in our partner surf camp in Ericeira, Portugal with the right wave for every level of surf ability! Located on the west-coast of Portugal, Ericeira is a beautiful fishing town just 35 km north-west of Lisbon and Lisbon Portela Airport. 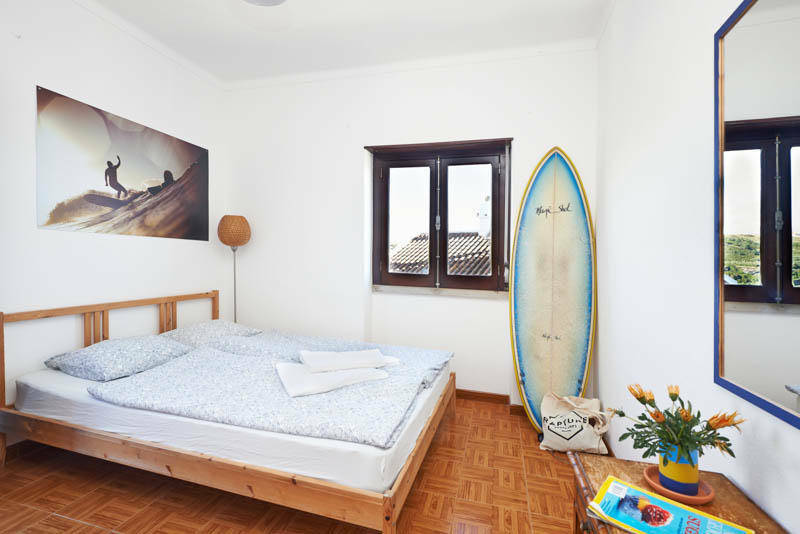 Our surf camp is only 200 metres from a blue flag beach with world-famous surf spots, such as Ribeira d’llhas, which hosts two world surfing competitions per year. 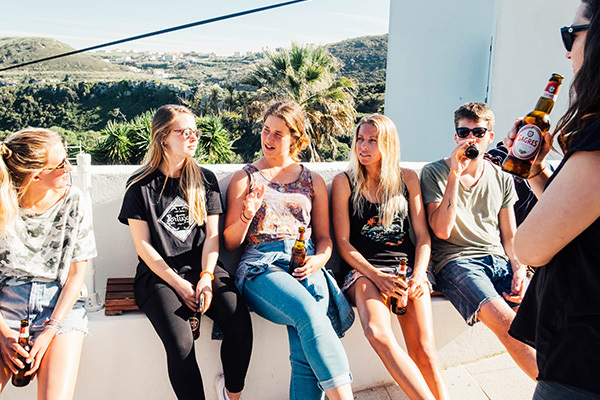 Our surf camp in Ericeira, Portugal is a spacious two-story, white-washed Portuguese style villa with a large outdoor area and panoramic roof terrace, perfect to relax on with a few drinks in the evening sun after a long day chasing waves. And with the town centre only a 15-minute walk away, you’re right in the centre of one of Portugal’s most famous seaside resorts. We offer both surf lesson packages for surf beginners as well as surf guiding packages for advanced surfers which can be booked onsite with the surf camp. Surf Portugal’s Best Waves Every Day! Star Surf Camps and all its partner surf camps are renowned for their fun, professional and enthusiastic approach to teaching surfing. All surf instructors in our surf camp in Portugal are experienced, fully licensed, qualified in the country they teach in and also have a lifeguard qualification. The town of Ericeira is known throughout Europe as one of the best spots for surfing all year round. The majority of Portuguese professional surfers come from Ericeira for its high quality and consistency of waves. One of the longest breaks here in Ericeira, Ribeira d’llhas, hosts two world surfing competitions every year. Ericeira has many beaches for beginners to learn on and also offers many perfect left and right hand reef breaks for more experienced surfers. All of these breaks are within a 20km radius of our surf camp. Included in your Surf Lesson Packages are either 3 or 5 x2hrs. of surf lessons as well as the use of all surf equipment (wetsuit, surfboard & leash). We divide our surf guests into groups in accordance to each surfers surfing ability. Our international team of professional surf instructors in Ericeira, Portugal doesn’t simply watch you from the beach, but gets in the water with you to help you catch the best waves and improve your surfing quickly. A theoretical introduction to the day’s surf spot, ocean safety and a warm-up are also part of your surf lesson. Please note that all surf lessons can only be booked onsite in the surf camp. Choosing surf guiding, you are picked up from the surf villa and taken to the day’s best surf spot best suited to your surfing ability. This may be one of our local waves or anywhere up and down the on Portugal’s Southwest coast. To ensure you’ll get to surf the best waves suited to your surf level, our surf holiday guests are divided into group and taken to different surf spots. Our expert surf team is always at hand to answer any questions you might have on your technique or the intricacies of the local point, reef or beach breaks. Please note that, in order to take part in our Surf Guiding Packages, you must be a confident and competent surfer. The ability to surf a shortboard and being able to duck dive is a must. For safety reasons, it remains at the discretion of our surf instructors to take any surf holiday guest on surf guiding tips. Please note that all surf guiding can only be booked onsite in the surf camp. Thank you. 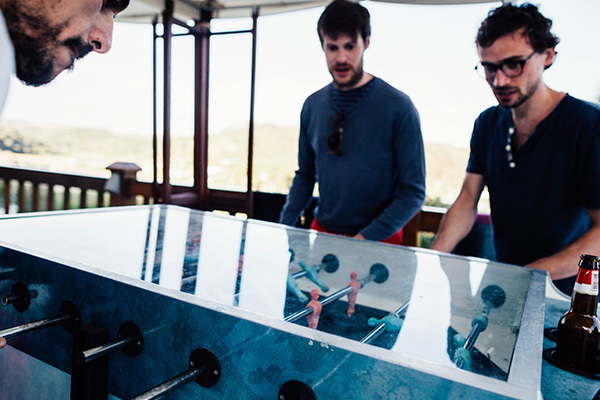 We know from experience that a lot of our surf holiday guests in Portugal bring their own surf equipment. If, for whatever reason you shouldn’t, don’t worry. We have access to a whole host of surf hire equipment (wetsuit rental 10€ PPPD; surfboard rental 10€ PPPD) and are at hand to help you choose the best surfboard for your surfing ability. We run surf lessons and offer surf guidance on 6 days out of the week, with Sundays reserved for free surfing, relaxing and exploring the area around the surf camp. Our Surf Camp in Portugal is the ideal place to relax after a day of surfing Ericeira’s world famous breaks. Head into town for some great Portuguese seafood or relax in the sun on our panoramic roof terrace with a cool drink and views over Lizandro River valley. 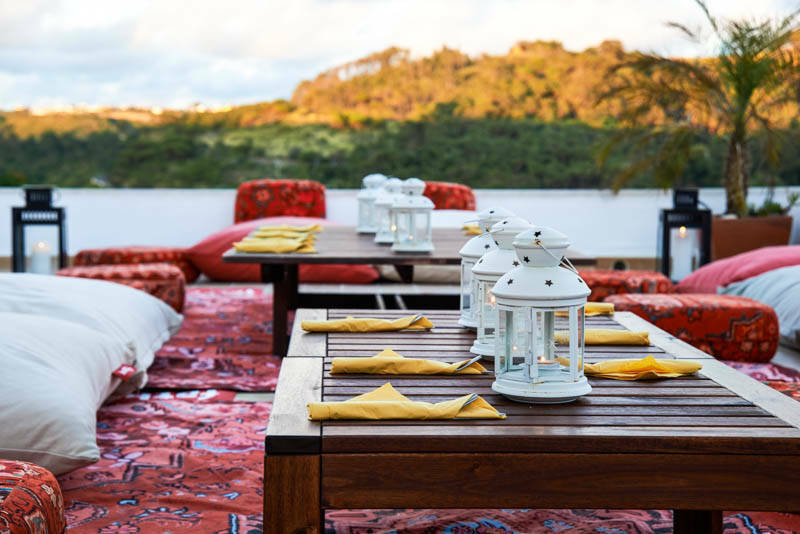 The surf camp itself is a white-washed Portuguese style villa with a large roof top terrace, perfect for practicing Yoga, enjoying sunset drinks and sharing surfing stories. The surf camp’s lounge area is equipped with a satellite TV and DVD player, and offers a large selection of surf magazines and books. Wifi is available everywhere in the surf camp. 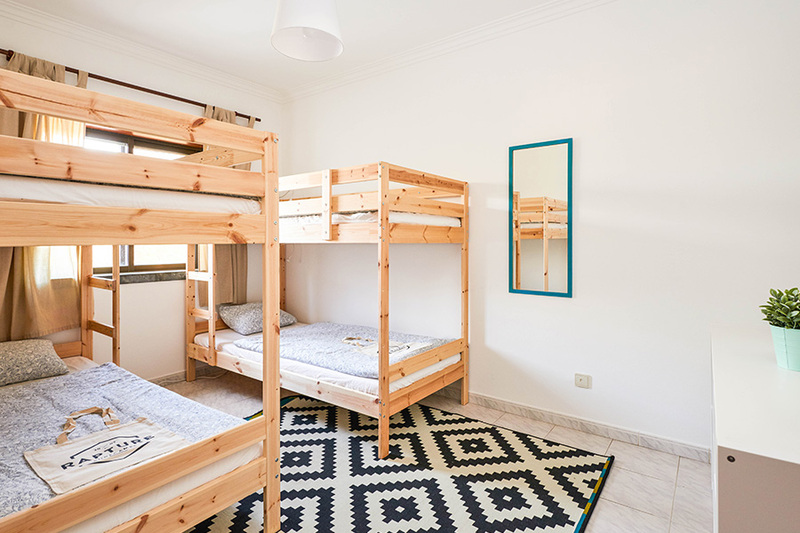 We offer traditional dorm accommodation for einer 8 or 4 surfers as well as more private rooms for 2. Relax in the backyard on the daybed for an afternoon bake in the sun whilst sinking a few beers or sipping a glass of wine or port from the local vineyards. The surf camp is situated to the right of Foz do Lizandro beach and is a 15-minute walk to the town centre. We provide all bedding, bathroom towels and can provide hair dryers where needed. There’s nothing more important than a healthy & delicious meal after a long day surfing Portugal’s amazing waves! All our week-long surf holiday packages include 7 breakfasts and 5 dinners (MON – FRI). 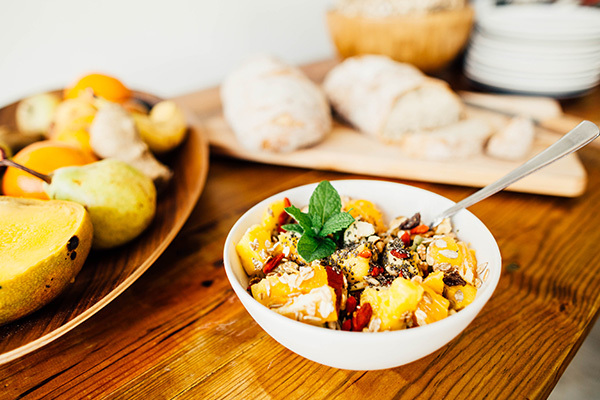 For breakfast, we provide you with a lovely buffet that include fresh juices and fruit, a variety of breads and spreads, cereals, jams and other local treats. Our dinners are very much the social highlight of our surf camp day when we all come together to talk surfing story. 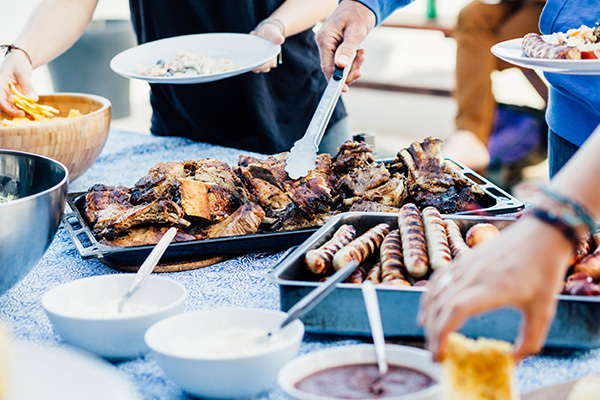 Among our evening meals are authentic Portuguese dishes as well as a night of pasta and a BBQ around the camp fire. 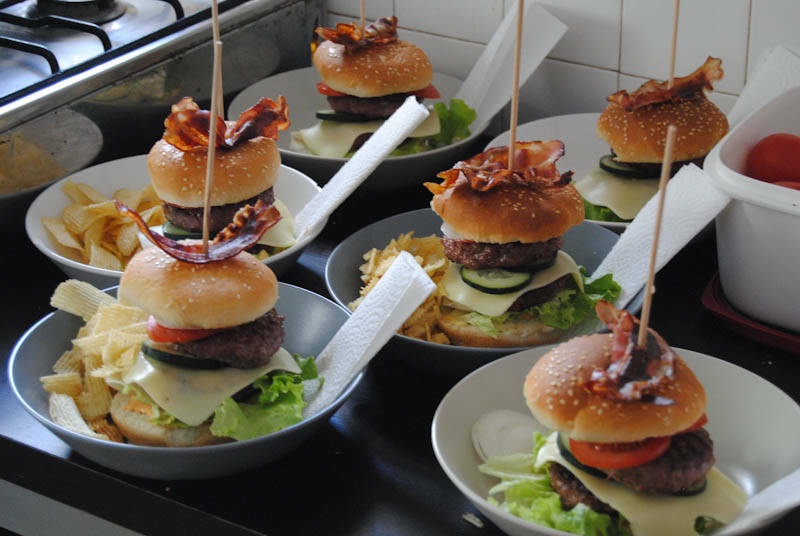 All our meals are home-made, and we use locally sourced products to help sustain local suppliers. As the first and only official World Surfing Reserve in Europe, Ericeira’s beaches boast unequalled quality and cleanliness. This 8-km (5-mile) stretch of coastline is absolutely packed with world-class surf spots and environmentally certified Blue Flag beaches. Why take surf lessons in Ericeira? Ericeira is home to a cluster of varied breaks with year-round consistent waves. There are several mellow beach breaks to choose from (Foz de Lizandro, São Julião, Praia do Sul, etc.) which are suitable for beginners and perfect for surf lessons. Why choose Surf Guiding in Ericeira? One of the longest breaks here in Ericeira, Ribeira d’llhas, hosts two world surfing competitions yearly. Ericeira has many beaches for beginners to learn on and also offers many perfect left and right hand reef breaks for more experienced surfers. All of these breaks are within a 20km radius of the camp. Closest surf spots: Foz do Lizandro, Sao Juliao, Pescadores, Praia do Sul, Ribeira d’llhas. What to do in Ericeira and around? Ericeira is a safe and friendly town with all the conveniences and amenities for a comfortable stay. Warm and sunny weather all summer long make it a popular holiday destination, whereas mild winters attract smaller crowds. 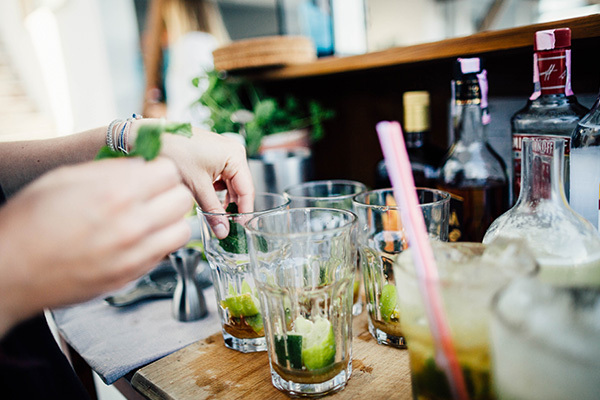 Ericeira offers excellent, fresh food and a selection of quality restaurants, cafés and pubs as well as a buzzing summer nightlife. Located close to Lisbon, Sintra and Mafra, Ericeira makes a great base for adventures to many cultural and historical sites. Ericeira has been certified as a World Surfing Reserve by the Save the Waves coalition, International Surfing Association (ISA) and the National Surfing Reserves of Australia. We offer pick-ups from and drop-offs at Lisbon Portela Airport for 30€ per person (each way). Please let us know your arrival/ departure times when booking your surfing holidays. Please note that there are no drop-offs between midnight and 6:00 am. Thank you. What to Pack for your Surf Camp Holidays? Please note that, from January 2019, a new Portuguese ‚Tourism Tax‘ law comes into effect which requires every tourist to pay 2€ per PAX/night (maximum of 7 nights or 14€ per PAX/stay). This new tax is not included in your holiday package price and is to be paid in cash upon arrival in the surf camp. Thank you. Any questions about our surf camp in Ericeira, Portugal? Surf Holiday Season Partner Surf Camp in Ericeira, Portugal: 01.04. – 31.10.2019! Can I rent surf equipment in the surf camp? We know from experience that a lot of our surf holiday guests in Portugal booked on our Surf Guiding Packages bring their own surf equipment. If, for whatever reason you shouldn’t, don’t worry. We have access to a whole host of surf hire equipment (for 10€/ day) and are at hand to help you choose the best surfboard for your surfing ability. What about insurance for the surf equipment? 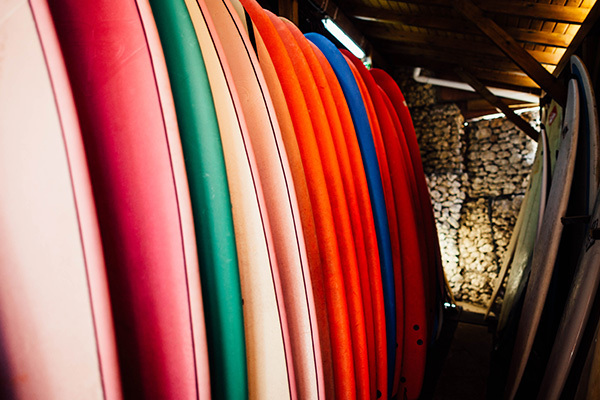 Yes, we also provide Surf-Gear Insurance. 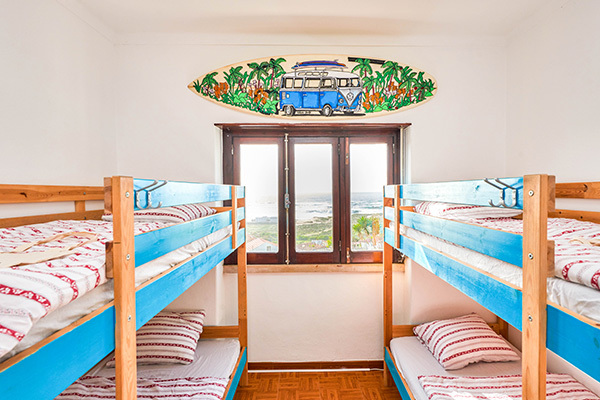 We've got a flat rate of 40€ no matter how long you're staying on our surf camp in Ericeira, Portugal. A new new Portuguese 'Tourism Tax' law comes into effect in January 2019. Please note that, from January 2019, a new Portuguese 'Tourism Tax' law comes into effect which requires every tourist to pay 2€ per PAX/night (maximum of 7 nights or 14€ per PAX/stay). 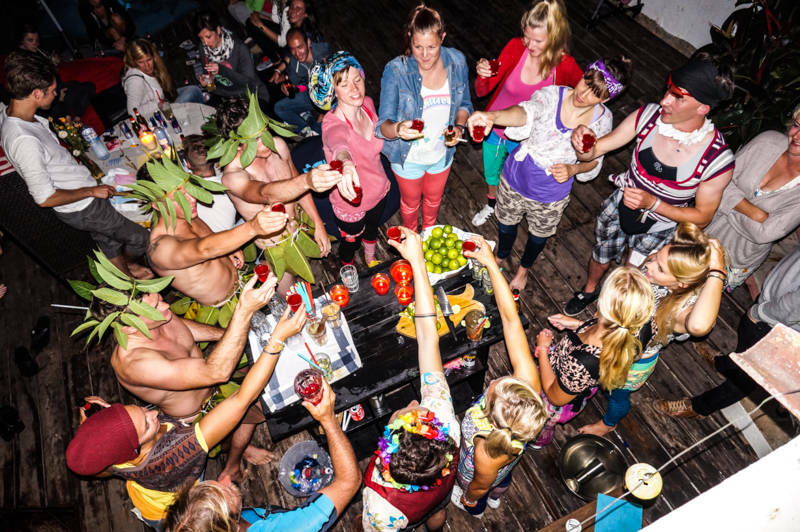 This new tax is not included in your holiday package price and is to be paid in cash upon arrival in the surf camp. Do you have private accommodation in your surf camp? Yes, although we offer traditional dorm accommodation for 4 to 6 surfers, we also have private rooms for 2. You can choose your preferred type of accommodation during the booking process. Can I do Yoga in the surf camp? Yes, of course! We offer Yoga lessons for just 10€ per person per session. You can add them during the booking process. Yes, it is. We have two private apartments for rent in which we host families. If you're looking for a fun-filled surfing holiday in a surf camp, then we have the perfect sunny family get-away. For more information, please contact our surf travel experts.